Clogged shower drain? Let's unclog shower drain. 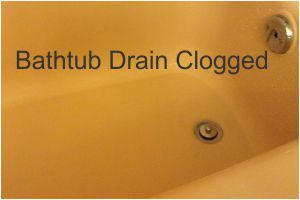 If you or someone you live with has hair, chances are very good that the bathtub drain is getting clogged. 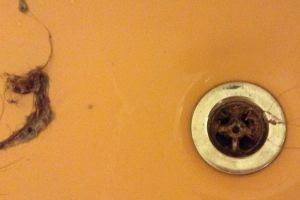 The most common problem with the drains in our house is the amount of hair that we allow to go down them. Even if you think your problem is deeper, it is worth a try to unclog the drain first. You do not want to be pouring in chemicals when you could have remedied the problem using good old fashion elbow grease. I know there are strainers that you can put over top of your drain to prevent hair from going down, but chances of any child or teenager cleaning it out after themselves is slim to none. So about once a year we have to unclog shower drain. It is not hard, you can do it. First you need to remove the stopper. On our model of tub (cira 1957) we had to put the stopper in the sealed position and then turn it counter clockwise. Our last tub (circa 2013) we were able to twist it off in the open position. Once the stopper was removed, you will see the drain. If your like the majority, your problem lies really close to that drain. You should be able to see soap scum and hair clogging the drain. You will need a straight short tool, a standard screwdriver works great. I am usually "pick the right tool for the job" kind of guy, but in this instance a screw driver is sturdy and its handle is nice and big so as not to fit through the drain holes. Insert the screwdriver into the drain holes and wiggle around a bit. Hopefully when you pull up, you will loosen the debris caught in the pipe. We found that once we loosened the gunk, we were able to pull on the hair that came out of the drain and it came out in clumps. Oh yuck, look what we pulled out of the drain. 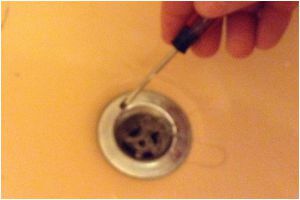 With a scrubber or your mother-in-laws tooth brush (just kidding) try to get the more of the debris by brushing the sides of the drain. 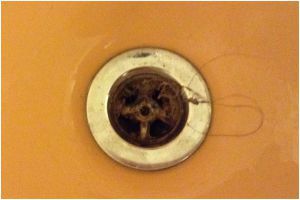 Be careful if you use a tool that has a small handle that you do not drop it down the drain. 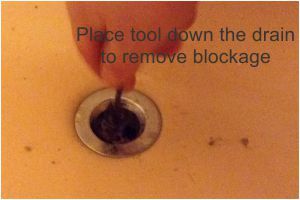 Take a papertowel or old rag and clean the drain as far down as you can reach. Wow, it is looking better already. Place the stopper back in place it is time for the real test. Run the water, you should hear and see that it is draining as it should. Now call the family and let them tell you how wonderful you are for fixing the drain from a clogged one to an unclog shower drain! Looking for other DIY projects to WOW your family? Wanting to hook up the Ice Maker in your Fridge? --Have your family enjoy ice from the fridge when you learn to install an ice maker. Wondering How To Install A Toilet? -- Wondering if you can get that copper plumbing installed or fixed? You can with these easy to follow instructions. --With step by step instructions, you can learn how to install a dishwasher yourself. -- You can learn how to install a washing machine easily. Great washing machine plumbing tips and advice!